It's Saturday night and I am playing in my art room. I have a cute little card to share with you tonight. I used a Pink Cat Studio image of Lily at the beach. I colored sweet Lily mermaid with Copics and sparkled her up with Spicas. I found some Basic Grey buttons in my stash that matched the Doodlebug Fruit Stand DP. CS is DCWV. Ribbon is from Michaels and I stamped the PCS sentiment with Encore Ultimate Metallic Silver. I used the template at Sweet Sketch Wednesday. What a sweet card. I love your adorable image. The added buttons are so perfect. Thanks for joining us. Hi Kathy, this is a really sweet card, I love this cute image and your pretty colour combo and design papers. Lovely card and thanks so much for sharing it with us over at Sweet Sketch Wednesday and good luck. What gorgeous, fun and bright colors! She is as cute as can be! Thanks so much for joining us this week at Sweet Sketch Wednesday. 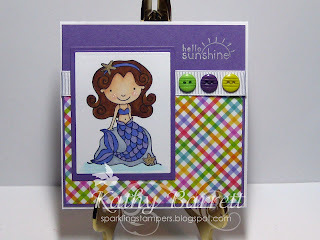 I love the colours you combined on this card ... and the mermaid image is adorable! What a bright happy card, your papers are super. Thanks for joining us this week. Oh my, this card could not be any sweeter!!! Such a darling image and fabulous papers...love it! Thanks for joining us this week at Sweet Sketch Wednesday. This is just precious! Adorable image and I love that plaid paper - what fun, perky colors! Thanks for joining us at Sweet Sketch Wednesday! Cute, cute, cute!! Thanks for joining in our sketch challenge this week over at Sweet Sketch Wednesday.